“I promise not to kill him,” were the vows of Dana Ellyn as she wed her longtime partner in art and life, Matt Sesow, Friday evening. 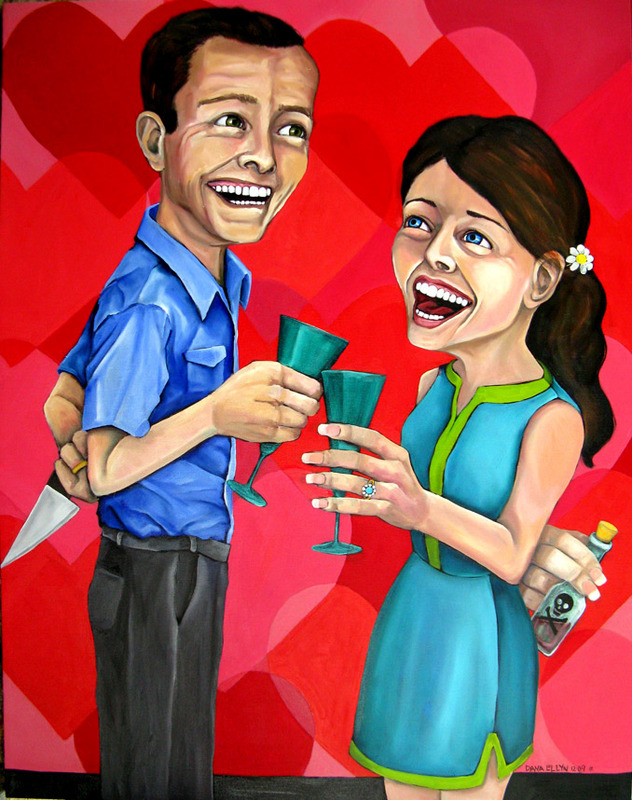 Facing them down from across the Long View Gallery was her painting, “Til Death Do Us Part,” which depicted a couple that closely resembled the couple, clinking glasses but hiding a knife and a vial of poison behind their backs. 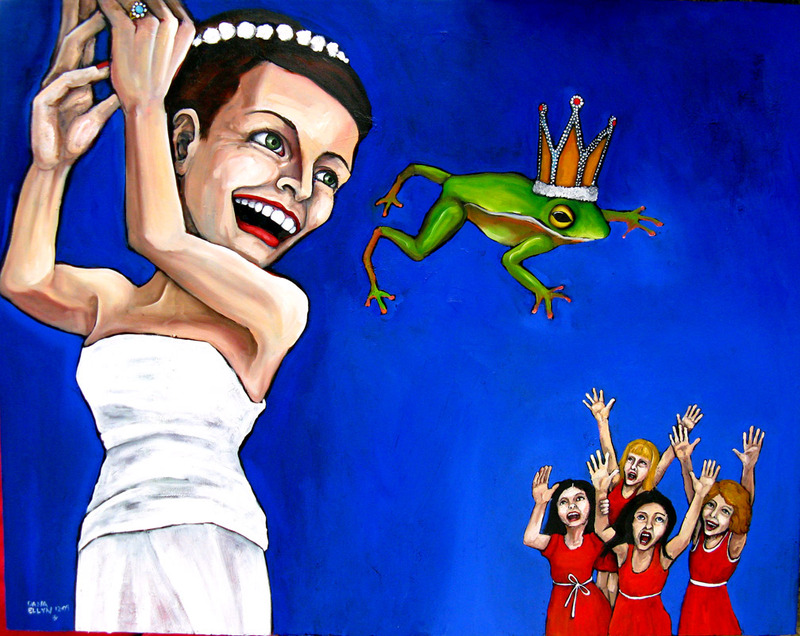 Nearby was “Institution of Marriage,” showing a straitjacketed couple, and “Letting Go of the Fairy Tale,” in which a bride flings a frog prince, rather than a bouquet, to her bridesmaids. Not your typical nuptials, for sure. The couple of eight years has long held nothing sacred in its art, so why should the wedding have been any different? In a ceremony stripped of all tradition, and after a monthlong publicity blitz, Sesow, 43, and Ellyn, 38, wed before a crowd of friends and strangers at an opening of their latest show, also named “Til Death Do Us Part.” But the wedding was almost derailed by the monster snowstorm that swept through the region Friday night. Indeed, the event was one of few not canceled because of the pelting snow, which followed guests into the gallery, soaking the floors. The bride wore teal. Waiting for her to join him in the front of the gallery, Sesow drew some of the characters that appear in his paintings in the fog on the windows. Then, the couple stood before a crowd of more than 100 friends and strangers, waiting for the ceremony to begin. “I never thought I’d have to say this, but we’re waiting for the press to get here,” Ellyn said. The couple assured bystanders and video crews during the ceremony that the whole thing was “not a PR stunt.” Their officiant, Jennifer Kalmanson, confirmed that the couple were indeed married after a short exchange of vows that appeared to be impromptu. Sesow choked up as he told the crowd, “I promise to keep loving her. 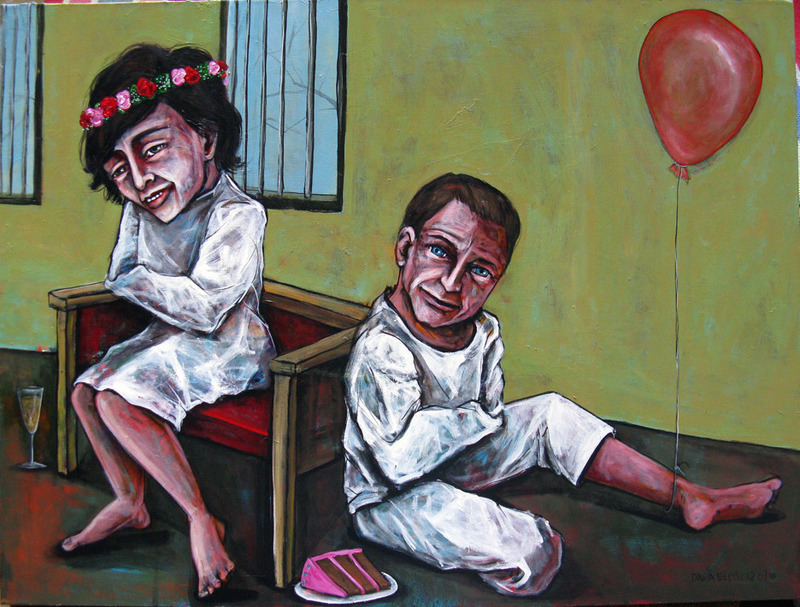 She’s taught me a lot—I guess I’m not self-taught anymore.” Ellyn tearfully declared her love for Sesow, telling the crowd how odd it was for two people who express themselves so well on canvas to have to express themselves with words. Nearby, their signed posters were selling for $10 apiece. The whole thing was done in about five minutes, when Kalmanson declared them married in the rather unceremonious manner that they preferred. But for all their swagger, Ellyn and Sesow did retain one very formal wedding tradition: They got a New York Times wedding announcement, ensuring that even the press who could not make it to their wedding due to the weather could still report the event. Then, the guests went back to admiring the paintings lambasting the institution that the couple had just joined.